I have a confession: I often find excuses to give Greg (and now Cate, apparently …) presents early. He’s not much better. I ordered him Carcassone because we’re always looking for fun two-player games. Well, it came in the mail Saturday + we were discussing playing a game. I tried not to give in and open the box, but then he guessed what it was! So I let him open it. Although, we ended up playing the two-player Settlers of Catan Card Game instead. 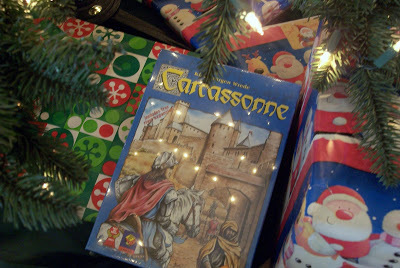 I put Carcassone under the tree, like that makes up for my weakness. 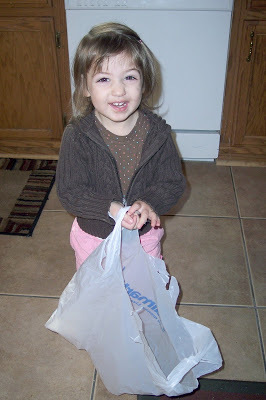 Cate likes to help carry stuff in from the car after a shopping trip. Apparently she even likes toting around an empty sack once we’re inside! The sack did contain some stocking stuffers for Greg, but I had to put those away so I didn’t away all the surprises! Her hair looks too cute like that! So, tell me about that other game. We bought an XBOXlast week and D just said it came with a Catan game. We’re going to try it out. I want that table!! 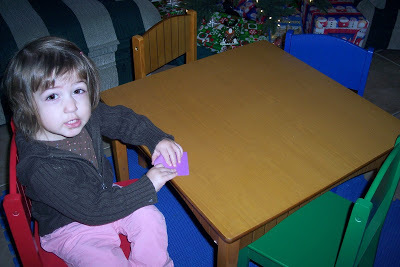 And I am terrible too, I usually talk about having gotten him presents until he starts to guess and then I usually hint around until he figures it out. Of course, then I’m sad that he figured it out! Oh funny! I was fixin to say that you are as bad as Teaque and Byron but she already confessed! I am the oppposite…I am the last one to open gifts on Christmas, because I want to prolong the surprise! I already have all my presents from Brad or at least know what they are. I have one left that he doesn’t know about, but that’s only because it isn’t in yet. I’m sure as soon as I pick it up, he’ll get it. We’re the same way!